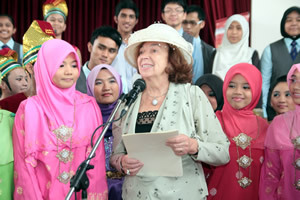 BANGI, 5 July 2012 – The First Lady of the Czech Republic, Livia Klausová, impressed with The National University of Malaysia’s (UKM) Centre for Gifted Youths, PERMATApintar® said teachers and lecturers from her country could learn from the experiences of the school. Madame Klausová, who is accompanying her husband Czech President, Václav Klaus now on a state visit to Malaysia from July 4 to July 7, expressed surprise at seeing a centre for precocious youngsters instead of an ordinary school. She said had she known earlier that she would be visiting such an institution, she would have brought over professionals, specialist teachers and lecturers from her country to study the way the centre operates. She made the remarks after a briefing on PERMATApintar® by its Director, Associate Professor Dr Noriah Mohd Ishak. Also present were UKM Vice-Chancellor, Prof Tan Sri Dato’ Wira Dr Sharifah Hapsah Syed Hasan Shahabudin and Deputy Vice-Chancellor (Research and Innovation), Prof Dato’ Dr Rahmah Mohamed. Madame Klausová, an economist in her own right, said the University of Prague might be interested in having a similar school. There are currently four Malaysian undergraduates studying there – two of them doing medicine. She said she barely recognised Malaysia after her first visit in 1996 when her husband was Czech Premier as so much had changed. The Czech entourage visited a classroom in session, a science laboratory and the main library of the centre. She also met some students and was told about the grueling schedule at the centre. They were later regaled by a quartet of students who played traditional Asian and Western Classical music. Madame Klausová presented the school with a traditional Czech musical instrument, the Dudy, which is similar to the Scottish and Irish bagpipes. 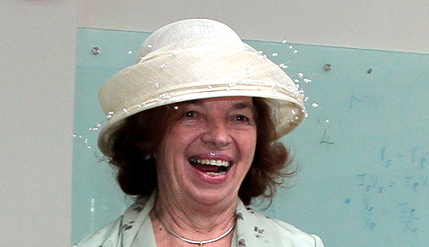 Livia Klausová née Mištinová, born in 1943 in Bratislava, Slovak Republic, has been First Lady of the Czech Republic since 2003. An alumna of the University of Economics, Prague, she married fellow economist Václav Klaus in 1968. They have two sons, Václav and Jan, and five grandchildren. The Czech Republic is a landlocked country in Central Europe bordered by Poland to the north, Germany to the west, Austria to the south and Slovakia to the east. Its capital and largest city, with 1.3 million inhabitants, is Prague. PERMATApintar® organised its first annual enrichment programme School Holiday Camp in 2009 developed in collaboration with Johns Hopkins University Centre for Talented Youth. It offers grade-level courses to gifted children between the ages of nine and 15. More than 1,500 students from Malaysia and other countries including Singapore, Brunei, Oman and India have taken part.